« Stunning Saturn, Sadistic Sippy Cups, Magnetic Pigeons, and More! Saturn's moon Phoebe, as seen by the Cassini space probe. The white streaks around craters are signs of water ice, though there are also carbon compounds that give it a gray appearance. Where do moons come from? Since I’m not a parent and I’m certainly not in favor of hiding important information like that from children, I’ll tell you: it depends on what kind of moon. Our Moon likely formed when a large object slammed into Earth before it had fully cooled, ripping off a chunk of material. Phobos may be a captured asteroid, or it might be what remains of a swarm of moonlets that once surrounded Mars. When we look at the Jovian planets with their large numbers of satellites, they appear to fall into basic patterns. Some moons have very circular orbits that are aligned with their host planet’s equator, and they orbit in the same direction their planet rotates. Moons of that type are known as regular satellites, and it’s probable they formed from the same disc of material as their planet. Other moons have strongly elliptical orbits, may have tilted orbits, and/or orbit in the opposite direction their host planet rotates. These are the irregular satellites, and that’s where things can get fun. 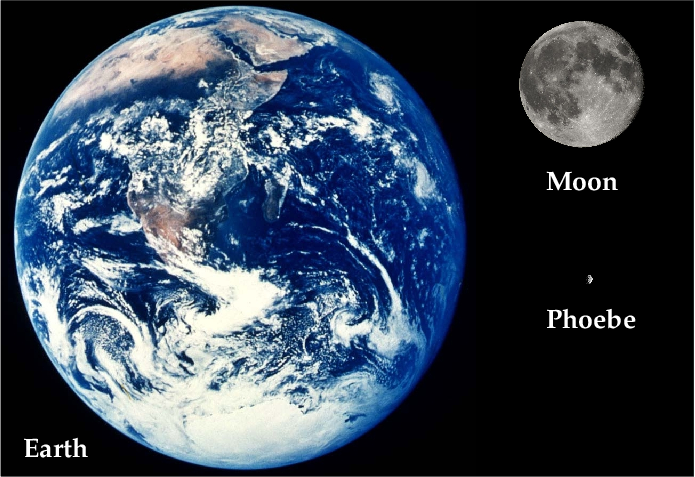 Phoebe's size compared to Earth and the Moon. 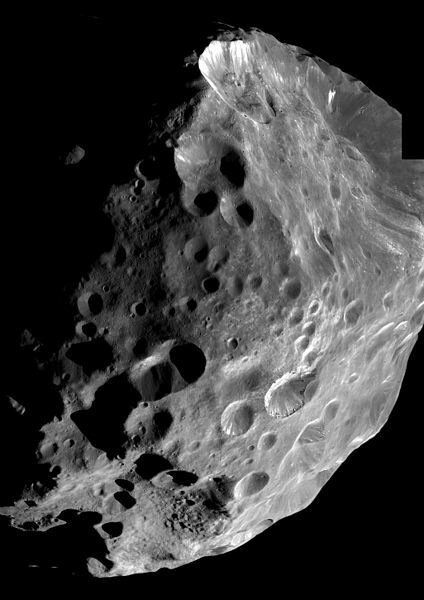 Phoebe is the largest of Saturn’s irregular satellites (though it’s still pretty small compared to our Moon), but it has another interesting characteristic: it’s a lot denser than the regular satellites like Titan, Enceladus, and so forth. That indicates it has a lot more rock mixed into its composition, to the extent that its core may be solid rock, which means it has a layered, differentiated structure. While it has significant amounts of water ice (based on observations of its surface), it isn’t a pure shiny iceball like Enceladus is: Phoebe has a lot of carbon compounds on its surface. Even though Phoebe isn’t spherical, it shows signs that it used to be more spherical (see the image below). From these properties together with its odd orbit, it’s obvious Phoebe is different. Map of how Phoebe deviates from being a sphere, from the Cassini imaging project CICLOPS. Even though it's not spherical, it's close enough that it probably used to be a sphere before it was battered by impacts. In fact, it’s different enough that researchers working with the Cassini space probe think it might actually be more like Pluto than Titan. According to a new paper by Julie C. Castillo-Rogez et al. , the shape of the orbit, the density of the moon, and the evidence about its shape and composition all argue for Phoebe originally being a Kuiper Belt object (KBO). KBOs are bodies made of ice and rock originating beyond the orbit of Neptune; Pluto, Eris, Makemake, Haumea, and Quaoar are famous examples of KBOs. While Phoebe isn’t quite as dense as Pluto (and nowhere near as dense as Eris! ), Castillo-Rogez and her colleagues think they can fit all the weirdness together into a single model. Here’s the scheme: early in the Solar System, a lot of small objects formed, known as planetesimals. Most of these objects were very small, but as they collided and clumped together, some were large enough to differentiate in structure. The ones closer in to the Sun were the building blocks of the terrestrial planets (Mercury, Venus, Earth, and Mars), which were mostly rock; far from the Sun a lot of ice got mixed into the contents, and these became the KBOs. However, some of them fell inward and became the centaurs—bodies that orbit the Sun in the region of the giant planets. In this scheme, Phoebe formed in the Kuiper Belt, and was large enough to be spherical. In the early days, it had a lot more ice on its surface, and was generally a larger, denser body, but during the early days of the Solar System, it experienced the same heavy bombardment other objects also felt. This bombardment stripped a lot of the ice and rock off its surface, leaving it aspherical and effectively aerating it—puffing out the outer layers so it became less dense. Like the centaurs, Phoebe fell inward toward the Sun, but was snagged by Saturn’s gravity, leaving it in the odd orbit we see today. Of course we don’t have as much data on Kuiper Belt objects as we do on Phoebe right now—Pluto, the best studied KBO, is so remote and small that we still don’t have resolved pictures of its surface yet. However, to this non-planetary-scientist, the model seems pretty interesting. I’ll be watching this story as more data comes in over the next few years.